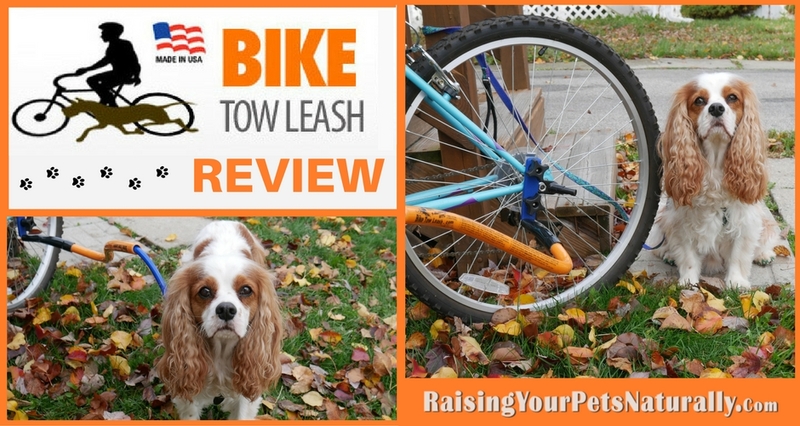 I am really impressed with the Bike Tow Leash and the ease of use and quality. It is definitely a product I can recommend to dog training clients and friends, especially for active dogs and active families. Dexter and I will continue to use the Bike Tow Leash, but because of Dexter’s limitations, we will be keeping a slow pace and short rides. He did enjoy it, so it will come out again this spring. 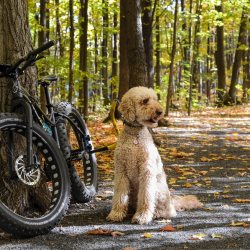 Biking with your dog is a great way to exercise WITH your dog. I know for me, being healthy and fit is always a challenge, because I hate being away from Dexter The Dog, and as of now, I don’t know any health clubs that allow dogs. 🙂 Biking with your dog can fill this gap and allow a person to exercise himself and his dogs at the same time, killing two birds with one stone. Who doesn’t like that? Today, I want to talk about a great bike attachment that allows you to safely take your dog for a bike ride. 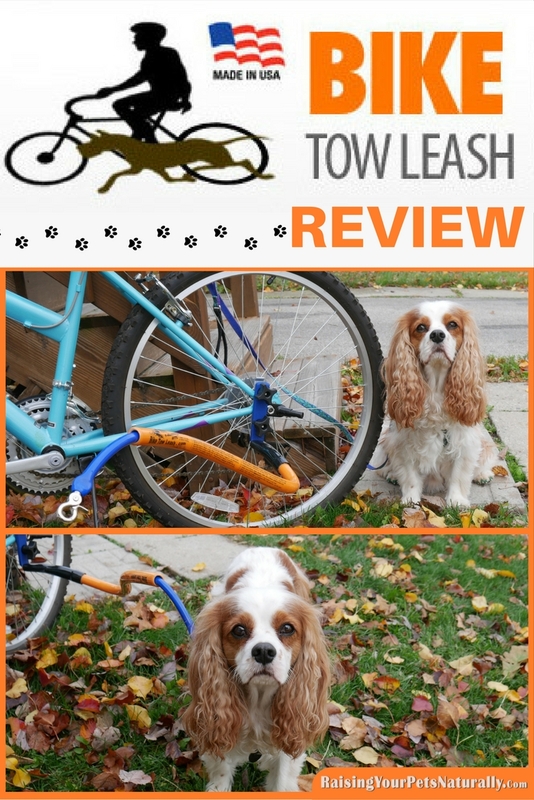 I had the opportunity to test the Bike Tow Leash and Dexter and I had a really nice time. But first, if you have not biked with your dog, please read my article on How to Introduce Your Dog to Biking. It’s really important to make sure you and your dog are safe during bike rides. When my Bike Tow Leash arrived, I have to admit I was a bit overwhelmed by all the pieces and instructions. But to be fair, I was given more than just the pre-assembled leash attachment, I was also given a universal mounting clamp, quick mount, and dog coupler to bike with two dogs. I decided it would be best for me to hop over to their website to review their mounting instructions. Whew, I’m glad I did. I attached the Bike Tow Leash leaning the clamp against the front of the axle nut with bolt above and below the wheel drop out. Don’t worry, I don’t know what that means, either—I just looked at the instructions. 🙂 That made the installation very easy. I opted out of using the quick mount. Once the leash was mounted, I needed to ensure that it hit the right portion of Dexter, at his shoulders. It did, so that part was easy. If the leash does not automatically fit your dog, there are printed and online instructions on how to adjust the height. Next, I needed to adapt Dexter’s harness for the bike ride. Because of the design of the Bike Tow Leash, they recommend a Martingale type collar. 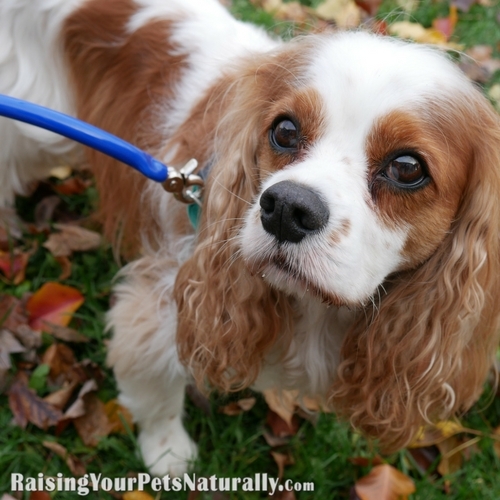 “We recommend using a Martingale type collar, having the secondary tightening loop and 3 rings. 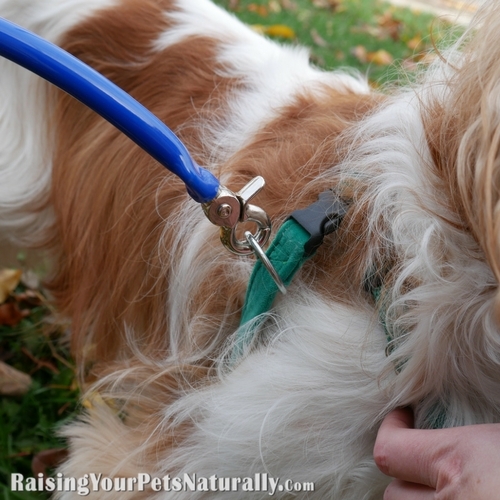 Use the center ring for walking on a regular leash and biking in high distraction and risk areas as the dog cannot back out of this type collar. Use one of the outer rings for normal riding so that you differentiate between loose leash walking and allowing your dog to propel the bike. The outer rings provide a looser collar and since the BTL pulls from the side the force goes to the side of the neck and shoulder not up against the dog’s throat.” I spoke with the company prior to accepting this review, since Dexter The Dog cannot wear a collar due to his neurological condition. We were in agreement that attaching a D-ring to the side of his harness at his shoulder would work. 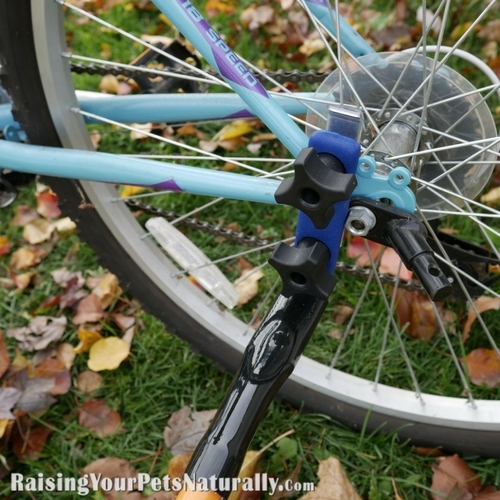 Bike leash attachments for dogs. Finally, we were off to the park! I thought taking our bike and Dexter to the park would be a great open space for our maiden voyage. The first step I did was to attach the Bike Tow Leash to Dexter’s harness and walk him and the bike together. This allowed Dexter to figure out where he was going to walk. Please note, that after speaking with the company, they instruct people to keep weight on the bike or at least walk from opposite side of the bike. Dexter didn’t seem to be concerned at all, so I felt we were good to start riding. Dexter and I went slow and steady. Dexter is 7 and has some mobility issues, so a slow pace was best. He kept a perfect pace and stayed at the right distance. The way the Bike Tow Leash is designed helps to keep the dog at the right distance from the bike. With a little encouragement when pedaling and turning, Dexter knew what I was going to do and when I was going to slow down and turn. A little dog obedience can go a long way in teaching your dog to bike with you. Hop on over and visit the Bike Tow Leash’s website for yourself. It’s a great product! Do you bike with your dog? Tell me in the comments. I wasn’t aware of bike tow leashes – so thanks for an informative post. Dexter seems to be enjoying himself. What?! I didn’t know such a thing existed! Totally cool! My brother would LOVE this! I now have the perfect gift idea. Thank you sooo much! I have such issues with my knees I have to bike ride and my husband loves biking. Great gift for biking dog lovers. So sorry about your knees. That really isn’t any fun. We often see people riding bikes with a dog in tow. This is a great idea. Thanks. Yes, a great way to safely bike with your dog. The Bike Tow Leash is a quality product. I have always been amazed watching dogs trot alongside their person’s bike. Our dogs have never been very athletic. They prefer relaxed walks through the woods. Woods are great adventures! Dex enjoys the casual ride. I love biking with my Husky, Icy!! We use a bike Leash as well, it’s a must for safety. It’s such great exercise for both of us, she burns a ton of energy biking with us! Oh, that’s great! I am so glad you and Icy are staying safe. She is such a lucky dog. I have always wanted to take my huskies biking! I am sure they would love it. Thanks, Katie. I bet they would love it! You should give it a try. The Bike Tow Leash is a quality product that allows you and your dog (s) to bike safely. I’m always concerned when I see people biking with their dogs on a regular leash, it just seems like an accident waiting to happen. The bike tow leash seems like a great solution. I totally agree, Beth. It is nice people are out and about with their dogs, but scary that they are being a bit risky. The Bike Tow Leash solves this problem for sure. First – I think you may be on to something in terms of opening a gym where people can exercise with their pets! I love the idea of biking with my dogs but fear being able to control them while trying to concentrate on not falling over 😉 This looks like it could be a great solution and I’m impressed that the company worked with you to figure out a solution around Dexter being unable to wear a collar. I think there are so many businesses, including gyms, that would benefit becoming dog-centered! Think about how fit this country would be. 😉 Yes, the company was amazing at helping me find a solution for biking with Dexter. And he sure did enjoy it! This bike tow leash sure does look like a great and safe way to bike with pets. Sadly, I can not bike anymore (for health reasons), but if I did, I’d certainly check this out. Thanks for sharing the great review! Sure thing. It’s deferentially making me want to bike more in the spring. If I had a dog, I would definitely try this! I think it would be a lot of fun to go biking with a dog. 🙂 I love that you can attach a leash to your bike with the bike tow. That makes things so much safer and more convenient. Thanks, Robin. So much safer with the Bike Tow Leash! I’d love to bike with Mr. N but he’s a little too small for me to think it’s safe. I saw someone biking with a Gentle Leader… this looks like a much better idea! Hi. The nice thing about the Tow Leash is the arm is solid so it makes the dog stay away from the bike. Dexter is 27 lbs and I felt totally comfortable with him and the Bike Tow Leash at a slow pace/ jog. Wow! This sounds awesome. Thanks for sharing. I honestly didn’t think about using this type of attachment for a smaller dog. Now that I’ve seen it being used, I think either Bean or Yoda could use it. With their smooshy noses, we will likely stick to long walks so we can watch them closely. I’m still glad to have learned that this can be used with smaller dogs. I have never heard of bike tow leashes, but it’s probably because I don’t bike with my dog maybe. My hubs and I were talking about getting bikes soon. Hmm, may have to give this a try one day. My wife has been wanting to get a bike tow for the dog. We are now in the winter season, as that is soon approaching. This looks like a sturdy one for sure.